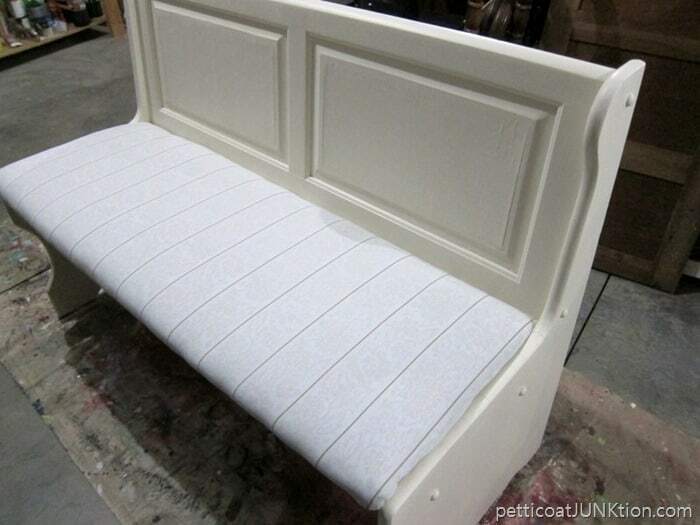 This is the white distressed farmhouse bench project from last week. I promised you guys all the details on the makeover, including the issues I had with the bench, so here we go. 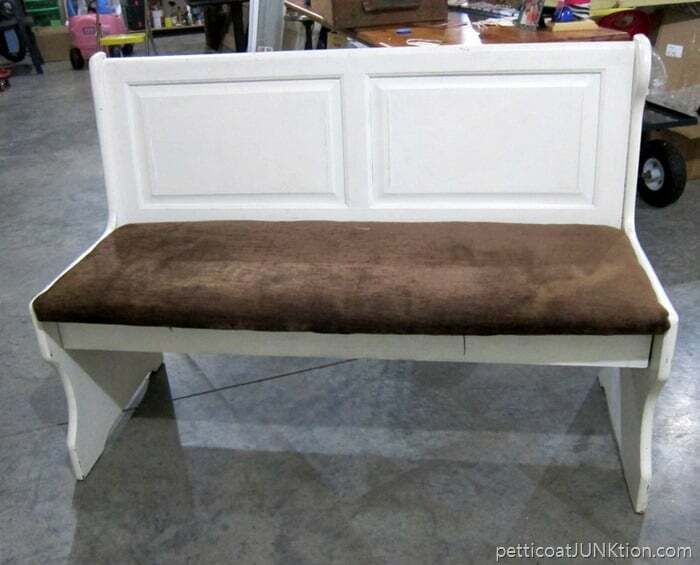 I got the bench at the Nashville Flea Market. The padded seat top wasn’t attached when I bought it but I didn’t think anything about it. The JTS (hubby, aka Junktion Technical Specialist) removed the screws that were on the bottom side of the padded top. 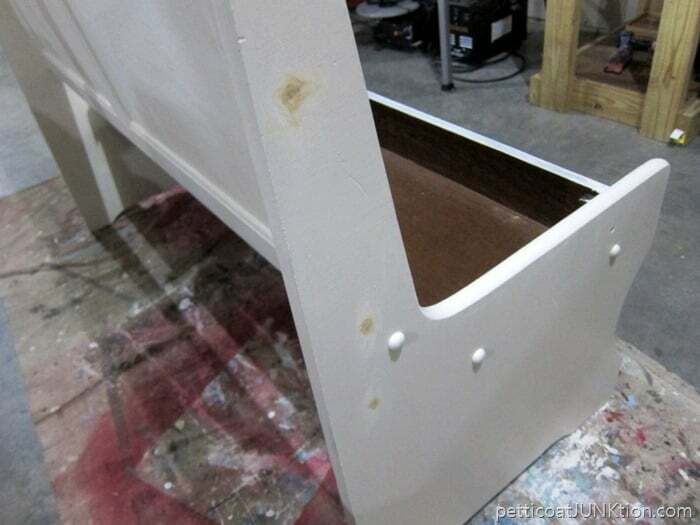 We added the wood pegs to the holes to hide the screws. And the remaining holes I filled with wood filler. The paint was a glossy white and I didn’t care for the shininess at all. 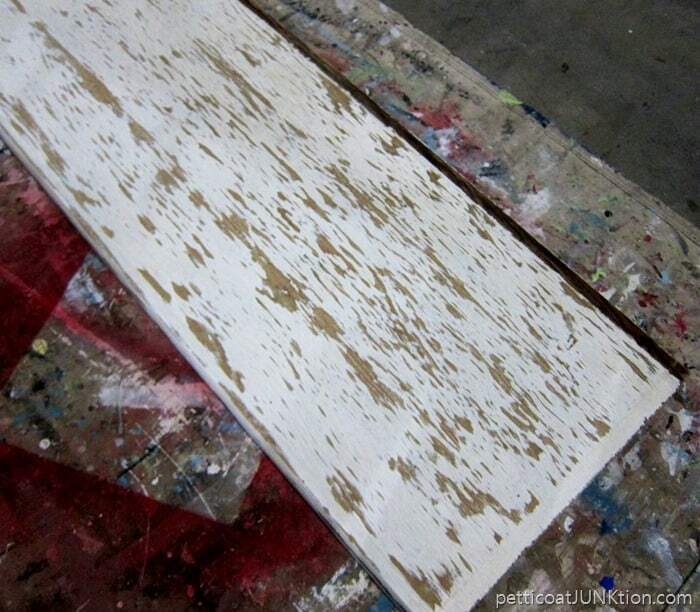 I painted over the white with Reclaim paint in Off-White. It has just a slight sheen, almost a flat look. While the paint was drying I re-covered the bench seat. I shopped for fabric at all my local stores searching for something grain sack looking or Buffalo Plaid (big now) or an airy turquoise and brown print. Couldn’t find a thing. 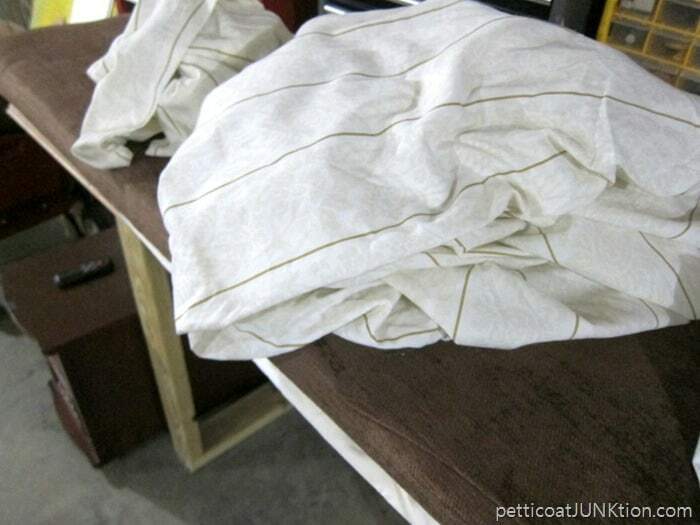 I stumbled around the workshop and found these sheets. They are old ones I was going to use for rags. I thought the really muted design with the goldish stripes would look good for Farmhouse style. I washed the sheet, cut it to size and stapled it to the seat. I laid the newly covered seat on the bench and thought…”This doesn’t look right, it’s sticking out way too far plus the fabric looks crappy”. I tried lifting the front edge of the seat and pushing it back so it could be secured with the hinges on the base of the seat. No go. There was no way the seat top could be attached with the padding on. 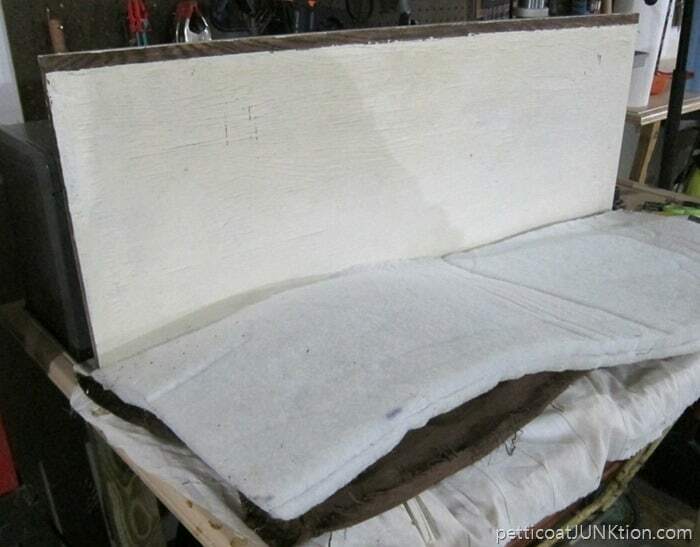 Apparently the seat was never attached after the fabric padding was added. Now what? 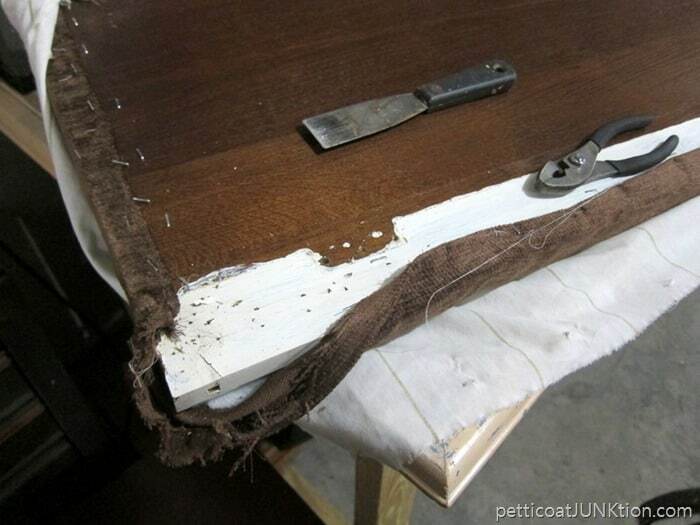 I decided to remove the fabric and the padding….there had to be a wood board under there, right? I pulled out about a million staples…okay, maybe a couple hundred. The JTS came out to the workshop about the time I was ready to pull my hair out and took over with the staple pulling. He’s awesome. You can’t see it in this photo but the wood was badly damaged. I guess the bench had been left in the rain and the wood was all rippled. Okay, now what? I grabbed a sander, then another sander and I sanded on that top forever. There were still a few ripples when I quit but I could work with that. 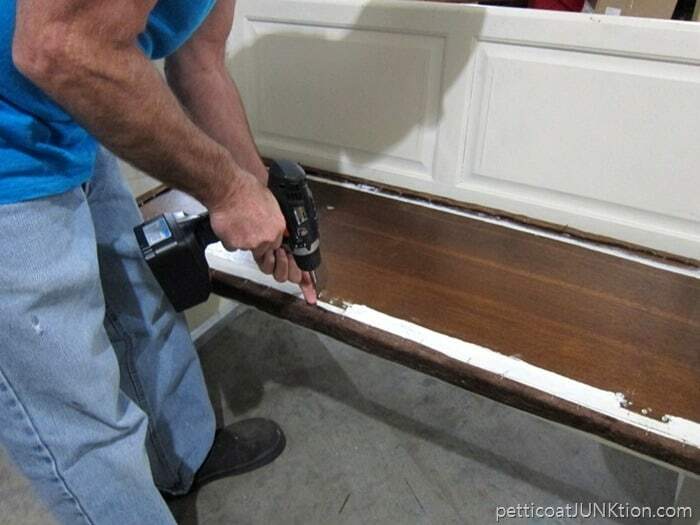 I also distressed the bench while I had the sanders out. This is what the seat looked like after distressing. I first thought to leave it that way but it was too darn ugly. I painted the seat off-white too then distressed ever so lightly. Now that the bench was all white with just a little distressing I had to add something. I decided to add a stencil and the color I wanted was a taupy grayish brown. 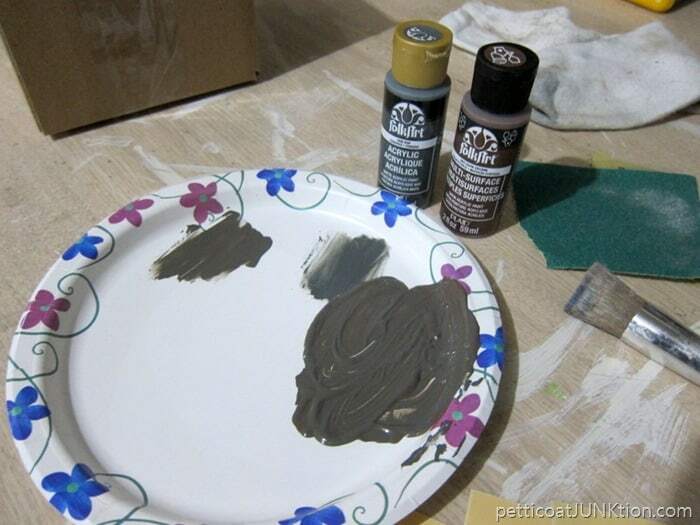 Nothing I had was the perfect color so I mixed a brown and gray together to get this color. Perfect. 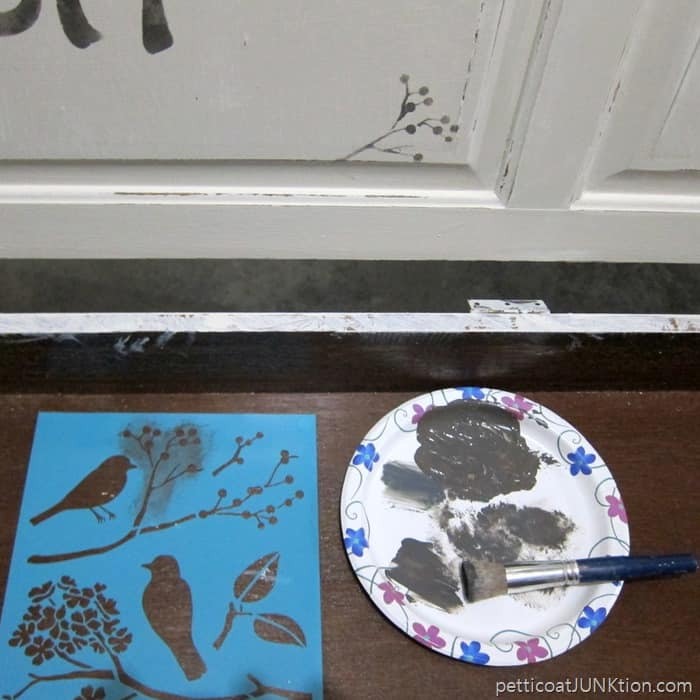 I could have stenciled a large design, big words, flowers…. just about anything…..but I decided to go simple. I turned the bench on it’s back and went to work. 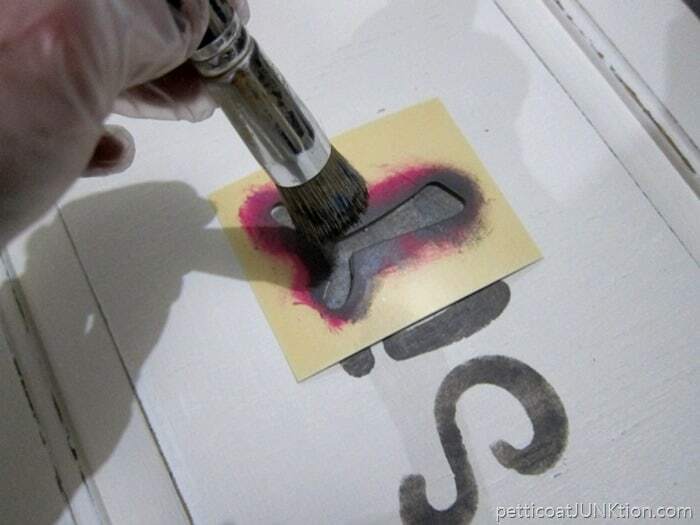 Stenciling is so easy. Remember….dry brush, dry brush, dry brush. I was going to quit at “sit” but I thought the bench needed just a little something else. It felt off balance. I know, I’m nuts. Anyway, I added just a bit of branch in the corner of the seat panel. I bought the fabric to make a bench pad but so far that hasn’t happened. That’s it. If you missed the bench last week….what do you think of it? Have you ever ran into problems like this when working on a project? See you tomorrow. Thanks for being here! I love this bench!! The colors, distressing and stencil are just perfect!! I’ve had several projects go awry and sometimes when I have to go a different route it turns out better than I originally hoped, and then sometimes I just put it away until I’m ready to deal with the project gone bad. Lol. Anyway, you did an awesome job on this!! Thanks for linking up at Sweet Inspirations! I love this bench. I love that you kept the stencil simple so it doesn’t take away from the character of the bench. I love shopping for “junk” pieces and making them beautiful again. I just love this bench. The color? Check. The finish? Check. The Styling? Double check. It’s just the total package……a great redo….great look. 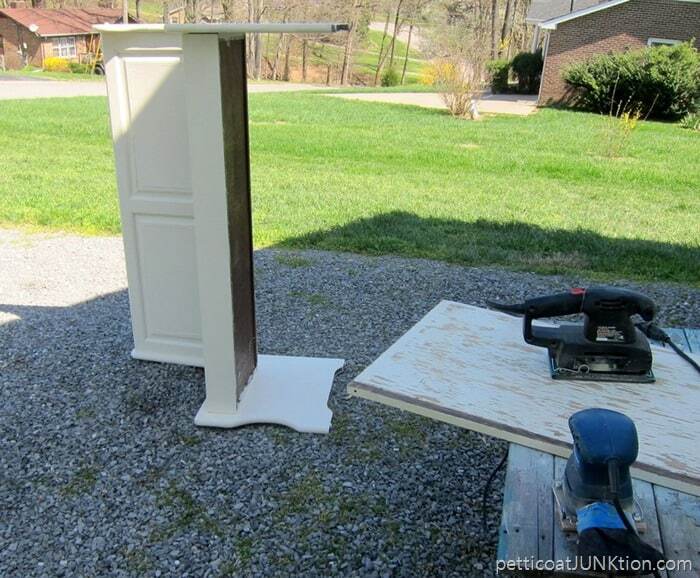 Thanks so much for linking to Friday’s Furniture Fix. We love having you share with us!! Very nice, love the simplicity of it.